This is my really fast and easy dinner when I don't know what to make but I'm starving. 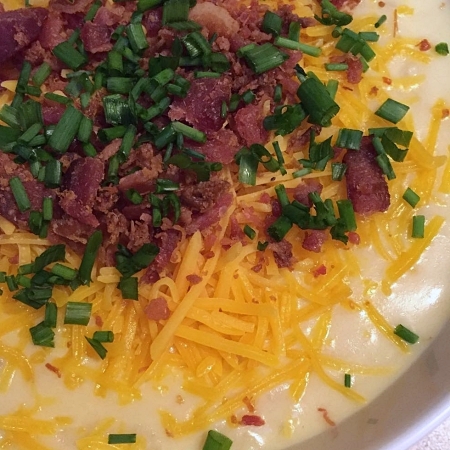 It tastes just like a loaded baked potato, and it's really not too bad for you. Toppings, like shredded cheese, bacon, chives, green onion, etc. Heat oil in a soup pot over medium-high heat. Add the onion and sauté until onion is soft. Meanwhile, put the potatoes in a colander and run under hot water to thaw a little. When onions are soft (not brown) add the chicken broth and milk. Bring to a boil. Add potatoes and return to a boil. Reduce heat and simmer until potatoes are soft (usually less than 5 or 10 minutes). Sometimes I purée the soup at this point, but you don't have to. Stir in sour cream. Ladle into bowls and add your toppings.